The firestorm over the firing of University of Virginia President Teresa Sullivan continues. Yesterday, hours after thousands of students, faculty, and workers held a demonstration in support of Sullivan, the Board of Visitors named Carl P. Zeithaml, head of the McIntire School of Commerce at UVA, interim president. Calling for the resignation of the head of the Board of Visitors, the faculty senate has planned a vigil that will take place this afternoon. 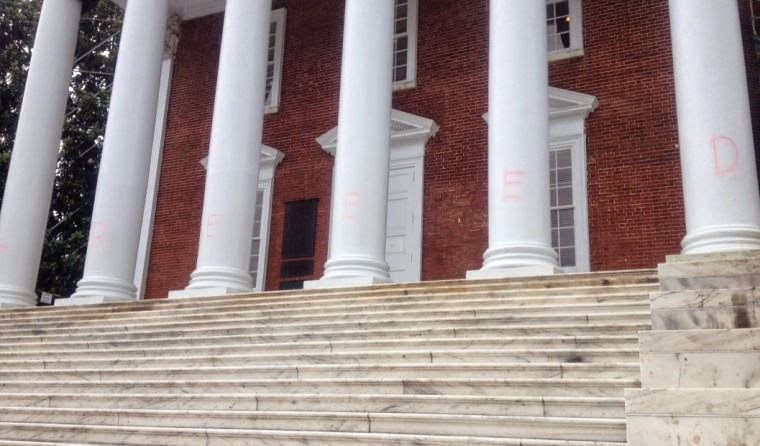 And the word "GREEED" was graffitied in red dye on the columns of the Rotunda, the central building on campus. Much has been made of the strategic mumblespeak offered by Rector Helen Dragas. After two years on the job, President Sullivan had not demonstrated enough "strategic dynamism." She apparently was forging an incremental path for moving Mr. Jefferson's University into the future. The big donors on the Board of Visitors wanted her to run UVA more like a business. It is certainly true that the importation of concepts from the business world, the corporatization of the university, the privatization of public education, and the financialization of everything have caused innumerable problems at public universities, none more significant than the $1 trillion of student debt that has placed students in a state of indentured servitude. But there's a serious problem with the way these arguments are being framed. Administrators have been running universities like businesses for decades. For this reason, the conflict between President Sullivan and the Board of Visitors is not a question of running the university "more" or "less" like a business. It is not a conflict between good, old-fashioned "university values" on one hand and nonsensical or inapplicable "business values" on the other. It is rather a conflict between competing business models. President Sullivan herself has long been applying the language of business to the public universities where she's served as an administrator -- UT Austin, University of Michigan, and University of Virginia -- all sites of intense privatization during Sullivan's time there. Indeed, this is precisely why the Board of Visitors hired her in the first place. In his piece, Vaidhyanathan praises Sullivan's administrative prowess by noting that, once established at UVA, "she had her team and set about reforming and streamlining the budget system, a process that promised to save money and clarify how money flows from one part of the university to another. This was her top priority. It was also the Board of Visitor’s top priority." Initially, at least, all actors were in agreement with regard to the need to rationalize the university's money flows. Ms. Sullivan's signature effort over the last year was a reinvention of Virginia's budgeting model. . . . Versions of the model are employed by a number of elite institutions, including Harvard University and the University of Michigan at Ann Arbor, where Ms. Sullivan was provost before she came to Virginia. Ms. Sullivan's faculty supporters say her two-year tenure did not allow enough time to test the model, which is designed to promote creativity and entrepreneurship among departments that will benefit directly from money-making programs. RCM was pioneered at the University of Pennsylvania in the 1970s and from there began to spread. By 1997, a survey found that approximately 16 percent of public universities and 31 percent of private universities had fully or partly implemented RCM. Since then, its reach has only continued to grow. Major universities that now use RCM include University of Toronto, University of Michigan, USC, University of Indiana, University of New Hampshire, Kent State University, University of Illinois Urbana-Champaign, and University of Iowa. As of fiscal year 2012, University of Arizona and and the University of Washington both have plans to implement RCM. Proponents [of RCM] contend that a university should be run like a firm, in which every academic unit carries its weight financially. In business terms, that means each unit is expected to be a profit center. Whether it's the college of arts and sciences, the dental school, or the business school, the costs -- which include salaries, space, and the like -- cannot exceed the revenues, whether raised through tuition, contracts, grants, or gifts. A school that runs a surplus gets to keep it, while a school with a deficit has to pay it back. What's interesting about this formulation is how much it resonates with the standard story about Sullivan's ouster. What appears here as a "contest of worldviews," one essentially corporate and the other essentially academic, is resurrected in a very different context today. Its appearance is the same, but on scratching the surface it becomes clear that the goalposts have shifted, that the worldview that Kirp identified as so clearly corporate and inappropriate to the university context has simply become part of the norm, a principle so obvious that it no longer seems out of place or offends. In a way, this invisibility, the fact that so many critics have missed the fact that Sullivan's leadership, like that of the Board of Visitors, is informed by business practices, is one effect of privatization -- we no longer recognize it even when it's right in front of our eyes. The structural logic of administration makes it impossible for university administrators today to opt out. No university president, however independent, can hold out for long against the pressures of the academic market. It doesn't make sense to criticize the corporate "mumblespeak" of the strategically dynamic Board of Visitors without at the same time understanding that President Sullivan not only used such language herself but made its implementation at UVA the "signature effort" of her presidency. Sullivan's ouster was not the result of a clash of worldviews, academic and corporate. It wasn't about running UVA "more" like a business. It was a conflict, rather, between different business models that could not be effectively brought together. That's why bringing Sullivan back, as the faculty senate hopes to do, will not keep the market out of the university. It's not administrators but students and workers that are fighting privatization and austerity at every step of the way. Only by eliminating the administrative class can a new kind of university emerge. This is a really interesting analysis. I wonder what a university the size of UVa (or any other flagship public school) would look like without any administration. Is there a precedent for this? Or would this be totally new ground? I'd love to read something about what such a school might be like. The BOV was aping mindless columns from David Brooks and airport business books, in secret, and then hoping to impose that on an entire university. Certainly administration is bloated at UVA as elsewhere, and salaries are too high. Donors have too much power. This happens when you have less than 10% state support. But to say that Sullivan and the Board each wanted to impose business thinking is nonsense. Pres Sullivan's parting words to the Board were that you can't run a great university like a corporation. Excellent and helpful post that goes a long way to explaining what is likely happening at UVA, with the very odd alliance of law school deans and PoMo english professors. See ongoing discussion of this post at Crooked Timber. Of course, understandably it leaves open a larger question: what is a genuinely progressive alternative model? Nice to hear from an insider. Obviously I agree with your critique of the Board of Visitors and their infatuation with David Brooks. At this point, pretty much everyone agrees they fucked up. The problem arises when people start suggesting making arguments about how the BoV's actions mark the incursion of business concepts and "mumblespeak" into the university world. By extension, they suggest that Sullivan had not only a different language but a radically separate worldview, uncontaminated with corporate concepts. That's simply false. You can't acknowledge that she was implementing RCM (however "concerned" she was about interdisciplinary work) and then turn around and call it "nonsense" that she was employing business thinking. It's not so much business models as resource allocation. Resources are finite and have to be allocated and that requires decisions. The issue is at what level are they to be made. Thanks for the comments. There's a difference between using business methods in the service of the university and letting business ideology drive the university. The former is what Sullivan was doing; the latter is what the BOV is doing. Anonymous 2:48: You can run a modern university with a much, much smaller admin, that does not get paid in multiples of faculty compensation (leaving room for decent professors wages instead of forcing the growth scholars' proletarianization, AKA adjucts). That's the Scandinavian model. To redistribute resources to pay decent labor's wages instead of the high-inequality high managerial/admin premiums v. adjunct poverty wages (with tenure profs in the middle as a facilitative buffer), you need to have higher public education *publicly funded,* at close to 100%, not increasingly privatized as the Anglo-American system has done. @silbey: I guess this is where we differ. To me, the line between "using business methods in the service of the university and letting business ideology drive the university" is much more blurry than you suggest. After all, the administrators, regents, and visitors who advocate for, adopt, and deploy corporate mechanisms certainly believe they're doing it in the service of the university. For example, the UC administration argued that, in the wake of the 2008 collapse, a 32% tuition hike was necessary. In any case, there's a tension between your argument and the standard line about Sullivan that I outline and critique in the post, in which she comes to stand, implicitly or explicitly, for the opposite of corporatization, to occupy a position external to the incursion of "business methods." We both acknowledge that Sullivan was pushing corporate practices ("RCM") -- indeed, much like the BoV ("strategic dynamism") -- and therefore does not stand outside this corporatizing, privatizing movement. The difference, it seems, is that you think she was doing it responsibly, while I'm much more skeptical about the possibility of privatizing "well." I certainly agree that the line is blurry, but there's a fundamental difference between incorporating useful business practices to further the academic mission of the university and remaking the university because it does not adhere to business ideology. In one case, the business practices support "obscure" majors like German and classics. In the other, it gets rid of them. @silbey: "incorporating useful business practices to further the academic mission of the university" is pretty much the definition of corporatization/privatization.
" is pretty much the definition of corporatization/privatization."